Chanel's next No.5 advertising campaign will be conceived and directed by Baz Luhrmann and will star Giselle Bundchen. Most of you might remember the 2004 campaign directed by Luhrmann - the swishy fancy OTT one starring Nicole Kidman (man, I love that one). It's supposed to be unveiled by the end of 2014 (in time for the run-up to Christmas, I guess). I really wish that Chanel would come up with a collective name for this trio of products! That aside, I want this! The trio (look here for more info) is a set of complementary skincare products designed to work in harmony with, and help rescynchronise, the skin's natural biorhythms. They are, in effect, "skincare primer"s - Le Jour is intended to be used underneath skincare (inc eye area if desired) each morning, and features salicylic acid (BHA) to provide daily gently gradual exfoliation, helping to even-out the skin. La Nuit is also designed to be used underneath the usual night-time skin-care regime, and contains hyaluronic acid to help plump-up the skin while you're sleeping. Le Weekend replaces the usual skincare regime completely, and has a glycolic acid (AHS) to refine the skin and makes it softer and more luminous (keep this one away from the eye area though). 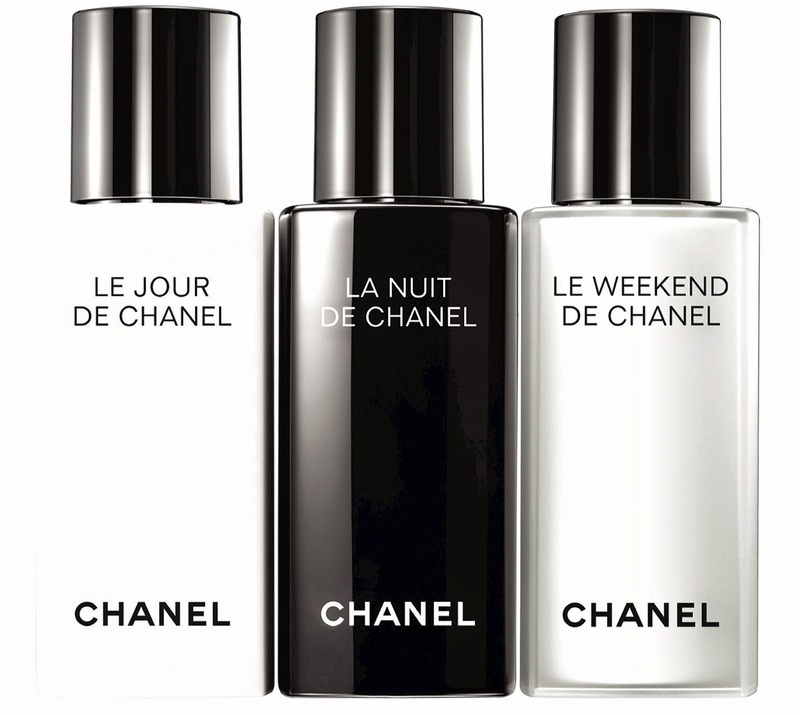 Just in time for summer, Chanel is introducing a travel set of the trio, it will set you back around the €98.50 mark for the three (15ml each). To put this into perspective, the full-sized versions are approx €75 each for 50ml, so if you compare like-with-like, you'll pay €1.50 per ml for the FS versions versus €2.18 per ml for the travel versions, but this is always true of smaller sizes - and who doesn't love dinky versions to bring away with you (also - it's cheaper way of checking these out to see if they suit your skin - I have done so and I can confirm that I am deeply smitten by these products). This is a movie from Chanel which explains the five key, emblematic colours in Chanel's universe - black, white, red, beige and gold. I did find the voice-over somewhat irritating, but that's a personal thing. This explains, with a backdrop of some genuinely beautiful photography, albeit flying by at slightly dizzying speeds, the "why" behind these, Chanel's most "primary" shades. Worth a look, but be aware that there is an almost-strobing film effect close to the end for a couple of seconds (I had to look away). That'll do for now. Come back in another few minutes and I'll post all about Chanel's summer makeup collection... it's as yummy as ever.